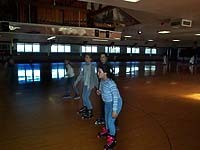 Homeschoolers skating at Oaks Park Rink in Portland. This month's Changing Face of America focuses on one aspect of how education has changed in the past fifteen years. In a three-part series, All Things Considered examines homeschooling. We begin by talking with three families across the country to find out how they homeschool. The families have written about their philosophy of home-based education and we've asked them to share Web links that have helped them in the education of their children. The pieces began on Monday, February 26, with a documentary about the three families: Keith & Amy Grant, of Beaverton, Oregon; Marilyn and Kalon Watkins, Indianapolis, Indiana; and Brook Randall and David Schwendner, Austin, Texas. On Tuesday, February 27, NPR's Robert Smith examines the socialization aspect of home schooling, and on Wednesday, February 28, NPR's Chris Arnold takes a look at the business of home schooling. Amy and Keith Grant live in Beaverton, Oregon with their two children. Jenny is 12 and Ian is 8. Amy is a lawyer who works out of her home and Keith is a software developer. Although we apply the label "homeschooling" to what we do, it is an inaccurate and misleading descriptor of our approach to education. We're most often neither "at home" nor doing "schooling". One of the many benefits of homeschooling is that each family can choose the approach that works best for the child and the family, and this approach can be adjusted as the child's and family's needs change. We have tried wide range of homeschooling approaches: structured "classroom-like" teaching at home, unit studies where we explored a particular topic from all angles, co-op studies with several other families, and child-initiated learning. We currently use an eclectic approach with some structure, some group projects, and a lot of child-initiated learning. We have found that we are learning at least as much from homeschooling as our children are. One of the first lessons that our children taught us was the distinction between "teaching" and "learning". "Teaching" suggests that we have wisdom to impart, and that the imparting of this wisdom to our children will accomplish something. While we believe we have some wisdom to share, we've discovered that the pearls of wisdom that we volunteer are not always eagerly received by our children, and are rarely integrated into their day-to-day perceptions. On the other hand, the discoveries that they make and the answers to the questions that they ask immediately become part of their model of the world around them. Therefore, we have re-defined our role from that of "teachers" to that "learning facilitators". With the exception of some math materials, we use no packaged curriculum. Since our children learn best by doing and exploring, we look for learning opportunities rather than textbooks. 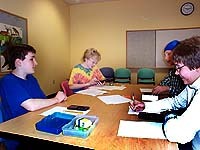 For example, we volunteer several hours a week at our local library. In the course of our work there, the children have learned to use the Dewey decimal system, to alphabetize easily, to find books that they want through the computer catalog, to use the computer to place holds and check their circulation records, to work with and take directions from librarians, and to show up on time and do work that is expected of them responsibly in spite of distractions. We don't have to set required reading lists or reading goals because they find many books that interest them in the course of working with the books and they are self-motivated to explore a wide variety of fiction and nonfiction works. As another example, we attended a presentation arranged by another homeschooler featuring a woman who survived the Holocaust, wrote a book about it, and now speaks to children about it. This presentation led to more family reading and discussions about the Holocaust, the causes, other countries' responses, and other "ethnic cleansing" situations. The Holocaust has far more meaning to my children than it ever did to me from reading about it in a history textbook. Similarly, the presidential election last year and the state legislative session this year have inspired many family discussions, learning about current events, and writing to legislators about issues that concern us. Later this year our daughter will participate in an "honorary capital page" program for children at our state legislature, including tours of the legislature, meeting with representatives, and discussions of the legislative process. The democratic and legislative processes are a bigger part of our daughter's experience at age 12 than years of civics lessons ever gave us. 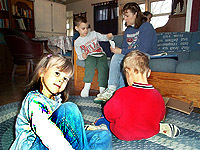 Homeschooling also gives our children time to be children. Our children have time to play with other children of different ages and abilities, and to appreciate their differences as well as their similarities. We are also firm believers in giving children time alone to imagine, create, ponder, and integrate all that they are learning into their own framework. Even getting bored has its advantages - it usually spurs the child to find something interesting to explore or to participate in one of their parents' activities. Our approach to our children's education has given us valuable time with our children, the opportunity to build deeper relationships with each another, and the chance to help each child develop their unique gifts according to their own developmental timetables. Links & resources recommended by the Grant family. Marilyn and Kalon Watkins live in Indianapolis, Indiana with their nine children. Carissa is 19, Emily 17, Sarah 15, Rachel 12, the twins Carl and Colin are 9, Chad 7, Rebekah 5, and Kurt is 3. Kalon is a luthier -- he makes and repairs violins. Even before we had children of our own, we were concerned about the negative influence of peer pressure. Thirty years ago, the evidence of this influence was 'smoking in the rest room' and 'skipping classes.' Today the stakes are much higher, as anyone knows who has read a newspaper. We wanted the first chance to teach our children that the "got to be bad to be cool" attitude is self-destructive and clearly wrong. We wanted the "knowing right from wrong" attitude to dominate in our children's lives and to be inseparably intertwined into their academics. God's word is the scale that we wanted our children to use to help them weigh their decisions; not the whim of the kid sitting next to them. 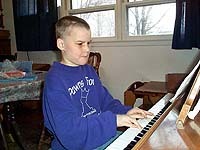 Carl Watkins concentrates on his piano lesson. Our first seminar on homeschooling was presented by Greg Harris. He gave specific scriptural reasons why we as parents were responsible for the training of our children. For example, "These commandments that I give you today are to be upon your hearts. Impress them on your children. Talk about them when you sit at home and when you walk along the way, when you lie down and when you get up" (Deuteronomy 6:6-7). Also, "Train a child in the way he should go, and when he is old he will not turn from it" (Proverbs 22:6 - NIV). These verses and others spoke directly to our hearts. Homeschooling was a direct answer to prayer. Who could possibly be better at nurturing the needs, gifts, abilities and spiritual growth of our children than their parents. In the end, it is the parents who are ultimately responsible for the education of their children (a mandate from God Himself!) regardless of who teaches them! Links & resources recommended by the Watkins family. Brook Randall and David Schwendner live in Austin, Texas with their son Alex, 14. Brook is an emergency room physician and David is a software developer. It is very difficult to generalize a "how to" for homeschooling. There are as many different ways to homeschool as there are homeschooling families. Even within a family, an approach that works well with one child may not be effective for the next child, or even for the next developmental stage. My approach to homeschooling has been to read as much as I could, talk to others who are doing it, and ultimately figure out by trial and error what works for my family. A friend once asked if she could come over and watch us "do" homeschooling. I laughed and suggested that she move in with us for a few days. For my family, homeschooling is more of a lifestyle than an activity. We do the same sorts of things that families with school kids do to enrich their children's lives, we just have more time and flexibility to do it. 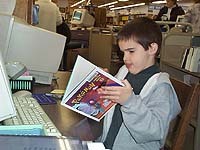 We make lots of trips to libraries, bookstores, museums, and both homeschooler and general community activities. We take vacations. My son reads a lot to himself. I read to him. My husband and I try to find the answers to his questions and pose interesting ones of our own. I am frequently asked what kind of curriculum we use. When my son was elementary school age, I used to say that we had a "game-based" curriculum. He played a lot a computer, board, card, dice, and word games which required math, reading, or vocabulary to play the game. Monopoly and the Carmen San Diego computer games are good examples. There is also a lot of good probability theory and combinatorics in family poker games. At the beginning of 6th grade, we discovered mathematics competitions. Now I say we have a "contest-based" curriculum, at least for math. The best contests are those which require creative problem solving and which draw from a broad gamut of mathematics rather than just memorizing mental arithmetic tricks. MathCounts for middle schoolers, and the AMC exams leading to the International Mathematics Olympiad for high schoolers are good examples. 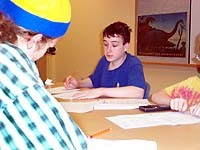 There are books of problems and solutions from prior year's contests to help students prepare. 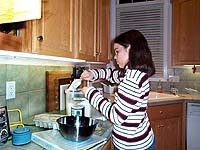 Similar contests exist in other areas such as computer programming, chemistry, and physics. Learning mathematics by preparing for challenging contests is a little like learning a foreign language by living in the country. You are learning everything at once without having material compartmentalized into chapters or courses. Useful math concepts, like useful phrases, come up again and again as you go about your business of solving problems or surviving in another culture. At first, you do not understand much of what is whirling around you. But as you see more and more problems, and hear more and more phrases, more of it becomes comprehensible. This emphasizes the interconnectedness of it, and encourages true comprehension rather than rote application of a formula or pattern. We also make extensive use of audio and video materials. We record programs from PBS, the Learning Channel, and the History Channel. We have also bought, rented, or checked out from the library a lot of educational videos and books-on-tape. Some of these, particularly for history or literature, are intended to be general interest. Others involve a series of lectures corresponding to a particular high school or college course. There is quite a range of quality for those. The test of a good educational video is whether or not I enjoy watching it along with him! We have had good luck with Annenberg-CPB, Standard Deviants, and The Teaching Company. One thing we do not use is textbooks. We own a few textbooks that we use for reference, but generally we look for other media. In addition to real books, videos, contests, and educational TV, we also take advantage of the expertise of others. We have a math graduate student who meets with Alex as a mentor, to discuss the type of mathematics that professional mathematicians do. We have a phonics tutor and a chess tutor. We have been involved in groups organized by other homeschooler families interested in studying geography, rocketry, deductive reasoning, chess. We also take advantage of commercial summer camps and Saturday or after-school programs. 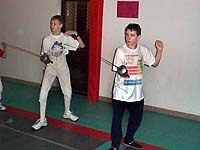 This provides some group activities and exposure to things like juggling, computer programming, robotics, diving, and fencing. There are more opportunities than we could possibly take advantage of. We have been very happy homeschoolers. I believe that our ability to tailor his educational opportunities has allowed Alex to be much more successful academically than he could possibly have been in an institutional setting. It has been very efficient. We are able to accomplish much more in a shorter amount of time than a classroom teacher can. It has also been pure fun! My husband and I have enjoyed learning along with him, and simply having the pleasure of his company. At times it has been a leap into the unknown. But as I see my son grow into a wonderful young man, I definitely feel that homeschooling has been a huge success. Links & Resources recommended by the Randall-Schwendner family.